The sister of a dear friend of mine, Maureen, is writing an Advent blog (visit it here). This is her first Christmas since the passing of her husband. Inspired by her first post (and now waiting with bated breath for her second….) I was inspired to try the idea out myself. My Advent season did not start out so placidly. I arose at 4:30am for a flight to California by way of Atlanta (reminder to self: NEVER TAKE A CONNECTING FLIGHT FOR A MORNING MEETING). While I was booked on Southwest, my flight was actually Airtran. This was not a good development. Airtran doesn’t honor TSA, their planes are OLD (like duct tape on arm rests old) and they don’t have the laid back Southwest friendliness I have come to appreciate spending so much time in the air. Anyway, we took off late and later landed in Terminal D at Hartsfield in Atlanta. Atlanta connections are an adventure – they involve lots of walking and trains and more walking (this is great if you have time to kill – which I did later). I woofed down a cheesesteak (yep!) and FRIES (yep again) while standing waiting to board only to learn that my frantic scurry for food could have become a leisurely four-course meal. Just AFTER all the pre-board passengers were loaded, it was announced there was a “ground hold”. New departure time: 12:45pm. WTF??!!! I quickly got on my tablet and searched Expedia for any flights leaving Atlanta. Delta had one. United had one. All leaving within minutes of where I was standing (and so impossible to make with the distance). I flew down the terminal with my charger cords dangling past me whipping at my legs in search of a new flight. I walked all the way to Delta and decided the $700 fee wasn’t worth it (not on State $$$). So, I sulked back to Southwest and found a kind gate agent to see what was possible. Had I not been so frantic in the first place, I would have learned that there was a plane leaving for San Jose (the next airport over) through Denver, but – the door had just been closed – and they would not open it (never mind that I saw many passengers arriving late after doors were closed later in my trip). I was FURIOUS by this point. Ah well, I found a cozy Southwest lounger with working (this is often not the case) power and settled in. This is where I found Maureen’s blog. Thank goodness. Her sweet descriptions of Christmas Advent calendars describing the idyllic town scene and the images behind the doors were just the antidote for my frazzled nerves. I took a virtual journey with Maureen to a quaint town near her, watched over her shoulder as she selected an advent calendar, felt the loss of her husband through her description of contemplating going to the movies by herself, silently encouraged her to invite the lady who sold her the calendar (and wished she could go to more movies) for a visit in the future. By the time I reached the end, I was eager to find an advent calendar and even peek ahead (I used to do that). Facebook was a welcome distraction. My friend Julie pointed out a nice restaurant One Flew South in the E Terminal. My Sweet Briar College friends, Karen and Kelly, offered wine and dinner if I didn’t get out. After a very long flight to San Francisco, getting my car and going straight to dinner, I was rewarded by finding on-street parking along an idyllic street in Mountain View, California right next to – get this – not one, not two, but THREE bookstores within a block of my parking space. Was this accidental? I declared not. I vowed to find an advent calendar. 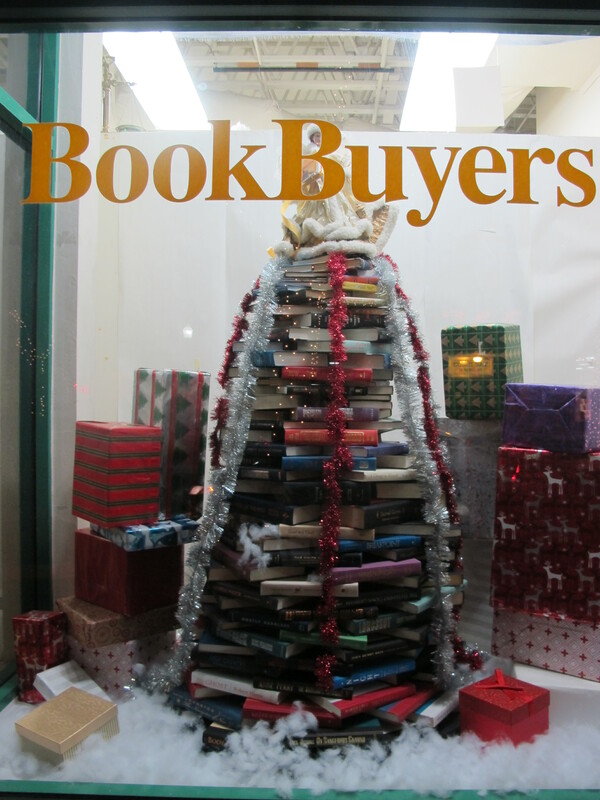 Book Buyers holiday tree in their window. Book Buyers – The first bookstore had a tree made of books and ribbon in the window. Once inside, I noticed the distinct smell of old books – a mixture of dust, organic material and my attic (filled with my Mom’s beloved books). I figured there wasn’t likely going to be an advent calendar inside. This was a book reseller. 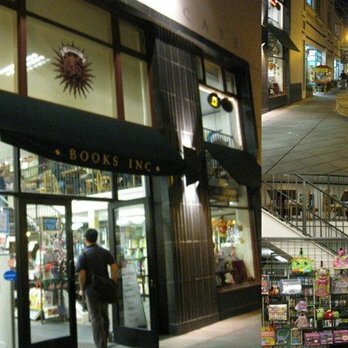 It figures in Mountain View, California – near Stanford University and in a town filled with very smart people – a book reseller could actually make a profitable go of it sitting in prime real estate. I pressed into the store and meandered through several narrow aisles stacked from floor to ceiling with books – used books, rare books. I never saw a shop keeper. 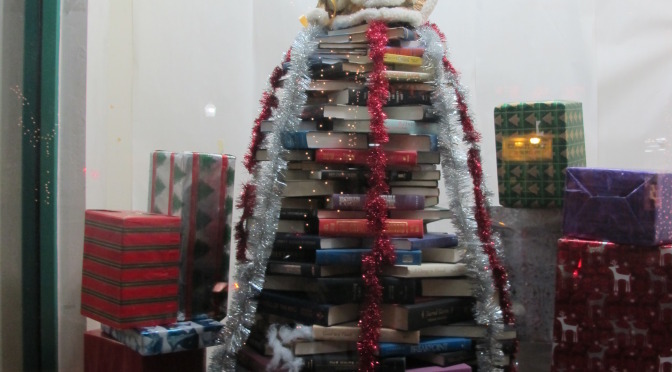 It seems the store runs on the honor system as there was a note on a table saying, “Gone for a snack, leave cash or call me with your card later….” Aside from a table of books selected for the holidays (for their literary entertainment, no doubt), there was no calendar to be found. However, I decided that the tree in the window would make a nice advent image. I stood in the doorway of the store briefly under the overhang (more on that later), pulled up my hood (it was raining steadily) and dashed across the street to a welcoming book store, East-West Bookstore. East-West Bookstore‘s motto is “Know Thyself”. This was worth the trip itself. Once inside, I was enveloped with the fragrance of incense. Books of every type to inspire, coach and transform were on Scandinavian inspired shelves of light wood. Each section had beautiful stones, jewelry and handmade items. 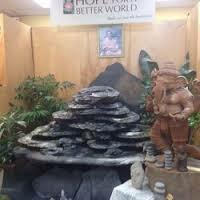 In the center of the store was an altar complete with figures of Buddah and a large water fountain. I admired the smooth stones and the sound of cascading water. No “Rockin’ Around the Christmas Tree” playing here… just the peaceful sound of water and faint chimes. While there was a nativity scene in the window, when I asked about an Advent calendar, the clerk looked at me quizzically. At the same time, a waif-like looking girl asked, “Are you still taking the aura photos?” The man who helped me thought for a moment and said, “Ah, yes, I remember as a boy my mother having a little calendar with windows. Yes! Yes! I remember now. But, no, we don’t have them. Perhaps you’d like a meditation pillow?” (gesturing to a large stack of silk pillows). 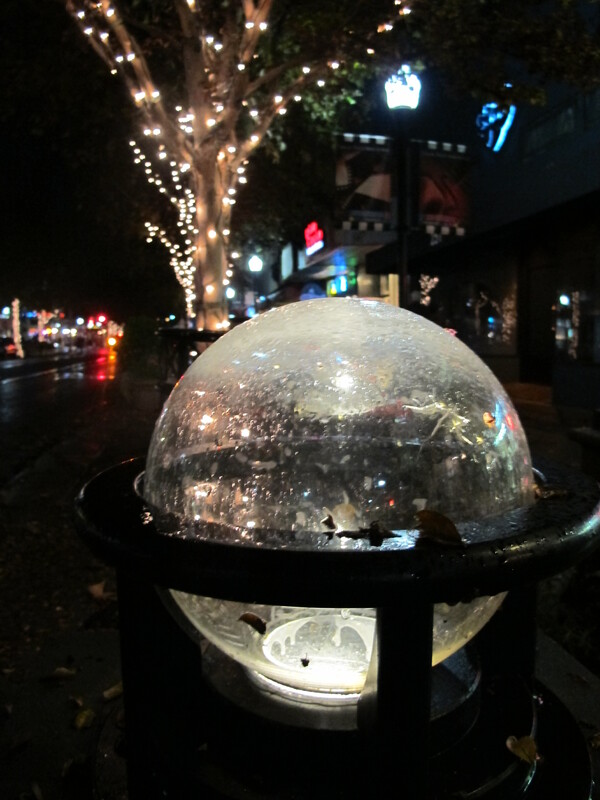 Walking outside, the rain had stopped, but a faint mist swirled around the lights. I dashed across to the end of the block to Books Inc.
Books Inc. felt like a more traditional book store. Cute racks of cards. A children’s section with young people curled up on the floor with books. A local school was sponsoring wrapping tables and refreshments. Upstairs, a cafe overlooked the space. Bouncy holiday music played overhead. I took a moment to stroll through the different sections noting the number of families and unique books and gifts they offered. It was refreshing to be in a store — and a city — where chain stores were not the norm. In most places around me stores feel like cookie cutters of their step sisters and brothers in numerous towns across America. Not here. I inquired about Advent calendars and was in luck. Not exactly the type I had envisioned; however, I snagged two Snoopie themed calendars for my two sons, Kent and Leland. I also got a blow-up reindeer and a melting snowman. But, no Advent calendar for me. Coming out into the rainy night with my package under my arm, I was struck by the beautiful glow of the street lights all along the main avenue in Mountain View. The lights were large globes which, covered in the mist, resembled snow globes. In the distance, twinkling trees were reflected in their orbs. Here — in the midst of a busy street — was an image worthy of any Advent calendar. I thought to myself, perhaps I will do an Advent calendar of my own.